Let’s be honest: Is there any bigger waste of time than manning a booth at an industry trade show? By the time you identify an event appropriate for your business, prepare for it, travel to the destination (along with any equipment and team members you need to bring along), set up and begin talking with customers, the cost and effort typically far outweighs the return from any leads you may cull. There is also lost productivity to account for as well. Depending on the scope and location of the event, some shows can pull employees away from their desks for up to a week at a time, and this may happen several times per year. Is there anything that can be done to avoid this time and money-wasting process? While it’s not wise to stop going to trade shows altogether, since you want to maintain some physical presence with your customers, you can effectively replace attendance at many of your industry’s smaller in-person events by hosting webinars instead. You won’t have to travel, haul equipment or pay for accommodations and dining. Further, if you host relevant, value-added webinars, and you have access to the right software for reaching out to and following up with leads, you can double the amount of new business you inspire. 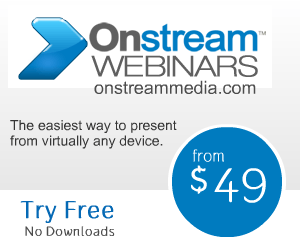 Onstream Webinars is one provider that will make this process easy. Using Onstream Webinars, your business will have all of the tools it needs to produce professional, high-quality presentations. With over 100 features from which to choose and a variety of chat options (including video, audio and text), your team will be in a prime position to promote its brand and generate new revenue streams. Click here for more information about Onstream Webinars.